CARROT BAY, Tortola, VI – With the issue of non-communication about the mould situation at the Isabella Morris Primary School in Carrot Bay hitting the public domain, parents are now calling on the Principal, Ms Sylvia Adams and First District Representative, Honourable Andrew A. Fahie to summon parents to an emergency meeting prior to the commencement of the 2013/14 academic school year in September. This news agency was flooded with calls from parents and concerned persons from the Carrot Bay community following yesterday’s, August 18, 2013 published article captioned ‘Tell us what’s going on with the mould issue at Isabella Morris – Parents’. Most of the callers were in support with the concerns raised by the other parents and also added that the Principal and the First District Representative should take it as a cue to call an emergency meeting. “Festival is over yes, we had our time of celebration of Emancipation but when you look at it we are right back in the same position like our ancestors,” said one concerned resident who identified himself as Mr J. S. Malone. Efforts to reach Hon. Fahie and Ms Adams have proven futile so far. “You use our tax money to do an investigation and you are refusing to give us the name of the company and any explanation about the outcome or the finding whatever you want to call it. Its time they call a meeting urgently and tell us something,” Mr Malone continued. According to Malone, he feels the present government is ruling the country under a dictatorship system as opposed to democracy. “If we speak out using our full names we are victimized in some way or the other, worse yet if you are a belonger or non-BVIslander. We can’t speak for our own rights and we are the ones that are the back bone to the development of this country,” he add. He said he feels there is also an attempt to silence the media as he had allegedly raised the issue of the mould at the school being on a hush with another news site over two weeks ago and his concerns were never made public. Another parent, who asked not to be named, said there are many issues surrounding the Isabella Morris Primary School that need to be addressed prior to the reopening of school. “They are really attempting to close down that school, I seriously believe so and if this Government don’t want a serious protest and situation on their hands they better forget that thought. We will not sit down and allow this to happen. We love Andrew Fahie and he has been doing his best but I think at this time he should call a meeting and let us ventilate this issue again asap,” she said. CARROT BAY, Tortola, VI – Parents of students attending the Isabella Morris Primary School in Carrot Bay, Tortola, say they are still not comfortable about the level of communication as to the mould situation at the school. “Our people bawling one time and then all of a sudden everybody gone quiet and when things get back as bad as it was before than we going to want to throw down and kill we self. I am not satisfied that we have been getting sufficient feedback as to what’s up with the final decision, if there is one,” a parent, who chose to remain anonymous, told Virgin Islands News Online. The male parent said he is very fearful the situation has the potential of escalating and he is particularly concerned about the safety and health of students. “I have a niece who was extensively affected by this situation and until today she has not regained perfect health. Yes she is back at school and will be going out in September but her parents still having to deal with honouring medical bills and meeting doctor’s appointment,” he said. According to the concerned parent, who was supported by others, there is still need for more feed-back on what is going on with the situation. “We have been quiet and so the Ministry takes advantage of our silence and they are quiet doing what, only God in heaven knows,” said the parent. Another parent said she was aware that a team of experts had visited the school as was promised in May, 2013 when the issue was brought to the public. “What are the findings, we don’t know until this day. We were told they did come but months have passed and no one has told us about the findings of the investigations,” said the parent. “The name or names of the company that did the inspection and investigations is one big secret, why? We need to know this information because I want to Google them and see if they are legitimate because I am suspicious since till now we can’t get the findings of the investigations. Or if they did submit a report why the Ministry of Education hasn’t come out publicly to discuss the findings with us?” she asked. 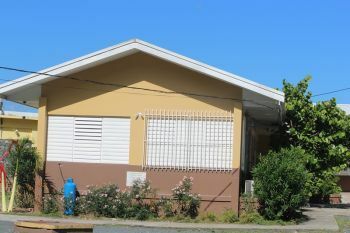 Back in May, 2013 students and teachers were placed in a temporary facility in Cane Garden Bay after more than thirty six (36) were reportedly treated for mould related complications. Since then the only other known feed-back was that international experts were brought in to investigate the situation. Well not surprise here as Myron up and down with piss about cxc trying to know Fraser and Fahie out of the headline when in fact not touching the real issues...How long? Not long!!! Dat man should never have been a minister of government! A week after jumping up and importing artist from Jamaica who's hit song is "Poom Poom Turn up" for thousands of dollars you people complaining? What these villages get they deserve!!! Why did they not ask government's ministry of education to make certain equal funding was available for the education system in the first district? You people act as if you care about your children and their education but you really don't. Archie Christian lives in the district, why does he not make himself useful and take up this cause? Let me understand this right over $100,000.00 for three days with about one hour dedicated to culture and no money can be found to deal with deadly mould which can cause cancer? Money for three days but no money for 9 months. We as a people are failures on every level and we have no one to blame but ourselves. This is not a VIP vs NDP thing, this problem did not start yesterday. Next year they will spend twice as much in this bad economy and education will suffer even more while the crime level for uneducated youth increases. then they will spend a $500,000.00 to bring is some big time movie star from the US to tell the kids to stop doing naughty things! A sad and sick joke when you look at the reality a christian community yea??? What would Jesus Do? Your statement is an insult to Carrot Bay people & to all the villagers of the area. You are fool to be jumping on anyone else but M...n. You obviously is a mischief maker & a fool. We tired asking him about this issue but he refuses to answer & obviously he has refused to address the problem. FFraser & Fahie enquired about it in Hoa & as usual he answered disrespectfully. I pity you darling. A lot of you push Christianity and you are the same ones who worst than the non-Christian. Thank God the Jesus you refer to knows all of y'all. Be a Parton the solution that's what Jesus would do. What does your stupid comments have to do with the story? The point is we have a mould issue that needs to be addressed and your suggestions are....? I'm happy you are hiding behind the blogs because I'm sure some who know you would be surprised! Stop coming on the blogs with no meaningful contrib! Myron alone is responsible. Fahie & Fraser tired asking him but he refuses to answer. He at it again even in the midst of this emergency he & his maintenance man scheming with Miami Now. Ayo will hear. Myron will come with some fancy speech to smoothly blame somebody else inorder to cover up his neglect of this school. Myron should be ashamed. The Governor Office discover mould since this & other government departments and done fix it but this guy playing politics with a serious matter like this. This squarely on his shoulder because he is the Minister responsible. The new maintenance man & M... Are very close f..... The maintenance man just return from working years in Miami. The company being used is from Miami. Now add up what is being set up hence the real reason for the delay. Full belly at it again. I hearing them want to permenatly close down IMPS but that will be world war hree & a half so let he & his gang plan. They will hear. Is his speech writer not the same person that worked for him during the political campaign? Why is no one investigating this? Will VINO do the honor of apoligizing again for comments,not at all,becuse the bloggers know the truth,and their line of freedom of speech. one thing for sure the father above is watching, so leave he to god VINO….the people will not apologize to he for voting him out next time around!!! hope the people are not being taken for a ride for an x...Cause that won’t work next elections! Nothing is going on nothiing! The government spending millions of our money on privately own buildings & land at Bangers Bay? So when the lease is up will government or the owner own the investment? I understand that is over 3 million dollars this lease value. Improving technical educationI is ok but making bad investments with our money toAkers a name for yourself & money is not. In looking at this picture posted in the article, there is the problem clearly shown, you take a concrete building and completely shut it down and it's simply a sweat box. It builds up moisture and the wooden roof begins to cultivate mold. The building needs more ventilation; especially for the hours during summer (hotter months) that it sits there completely closed down. At minimum, the Maintenance Crew can go there and open up the building for a number of hours to help ventilate the building. We are having a major problem in the BVI, contractors, are building and designing roads and our public buildings and its getting us in trouble more often these days. Allow these educated engineers to use their expertise to design, and then contractors, you can build. People let us not just decide these buildings never had mold back in your glory days. Know that the climate has changed, material we build with has changed, population has grown so the air has more density etc etc. That's why we educate our people now, they are up to the times and can put in place preventative measures so we can stop spending so much time and money on cures. We got to maintain and not repair so often. Good luck with the school. Mould is not a surprise. The school structure needed to be checked be fore they installed A/C and make sure you have the proper mix of fresh air and A/C. Automatic closing doors etc... . Now the place has mould. The Government and Public Health need to step in and get Emergency repairs and cleaning done. Who cleans the Air conditions? What do they do when a child has a cold, in these enclosed rooms? Who or what is used to regulate the temperature? Number of things and processes need to be address when you change school environment. Non the less, it's a serious matter and could cause law suits. Out the damn politicking aside and get on the ball and get the school clean and fixed up. My child used to go there and she used to complain all the time of the bad air and the bad feeling she got and on top,of that these schools and their nasty bathrooms. It's a lot of things. GET IT FIX and move forward. NO EXCUSES.